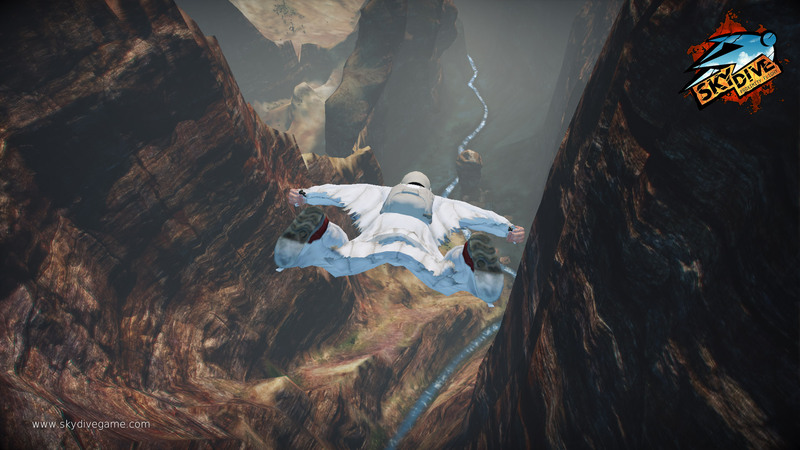 Gaijin Entertainment has not only been busy on the PS4 port of War Thunder, but they have also managed to muscle out Skydive: Proximity Flight for PS3. 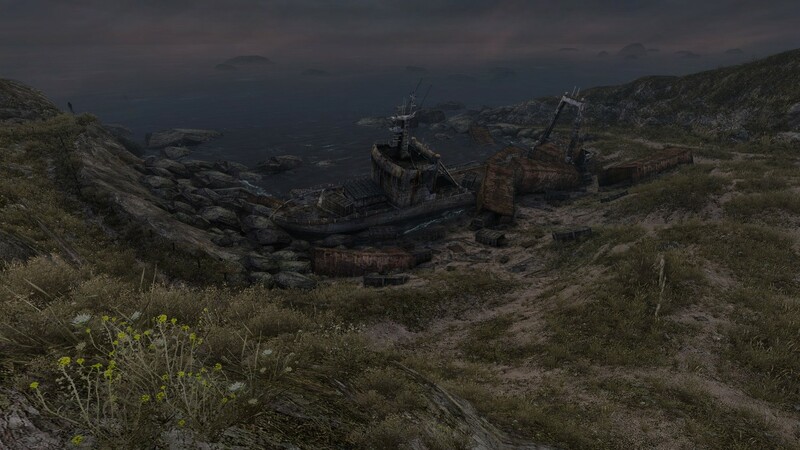 The first time I pressed the X button to dive off a cliff I was immediately compelled to slide to the edge of my seat. I was captivated by the overwhelming sensation of actually flying. 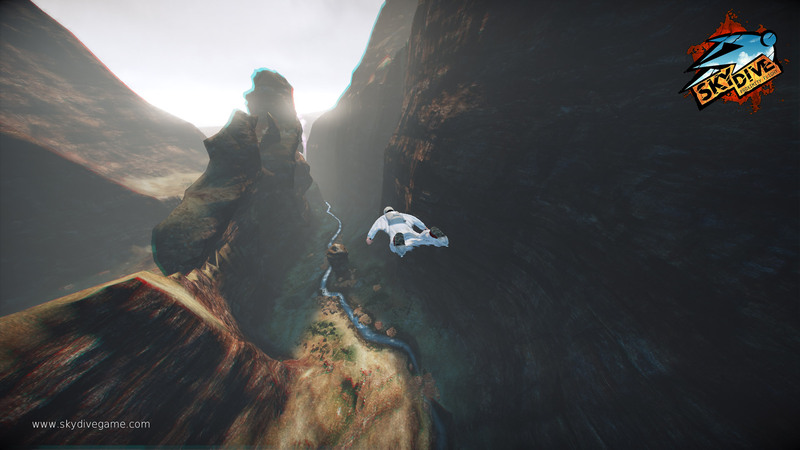 Skydive: Proximity Flight is the most invigorating game I’ve reviewed to date. As I sit here contemplating which emotion best conveys the overall experience of the game, I find myself stuttering. In one word, it’s pure awesome. This game is a foreshadowing of what’s to come from Gaijin Entertainment and that excites me. 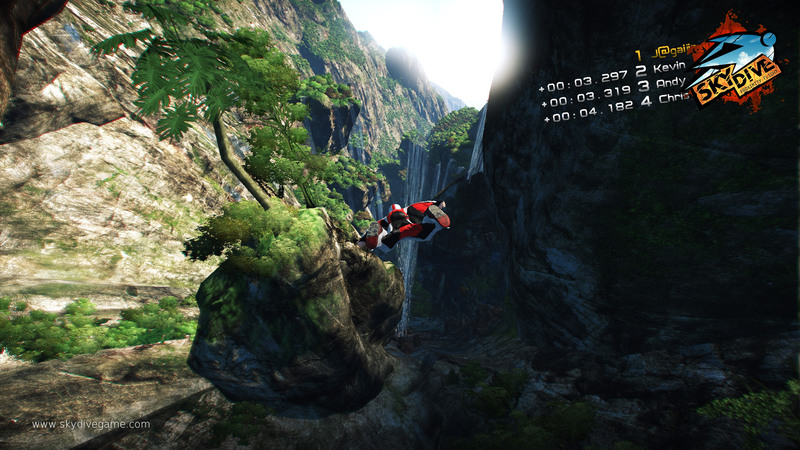 The meat and potatoes of Skydive: Proximity Flight is both the initial cliff jump into a dive and the proximity flying itself. 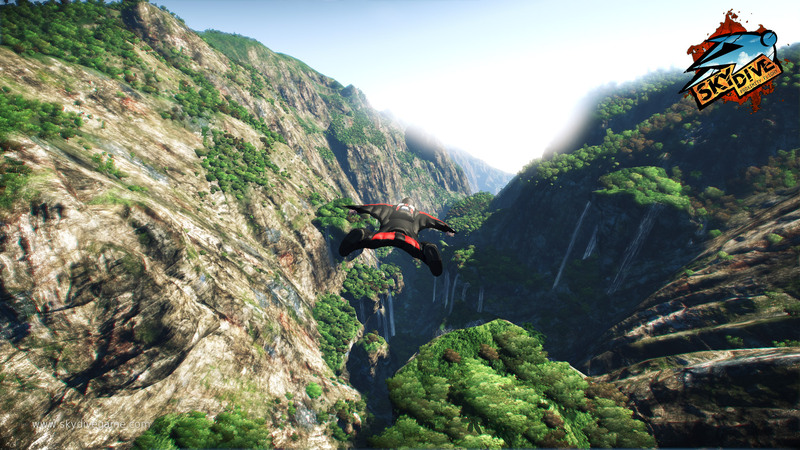 For those who aren’t privy to what proximity flying is, it’s basically an adrenaline packed cliff jump using a specially designed flight suit to fly as close as possible to mountains, trees, buildings, really anything that can otherwise kill you. As suicidal as that sounds, it makes for one hell of a flight sim. For all intents and purposes, Skydive: Proximity Flight captures the feeling of actually being a professional in this extreme sport perfectly. There are three ways to control your flying squirrel person: DualShock 3 motion controls, DualShock 3 left stick, or with two Move controllers. It will not work with just one Move controller unfortunately, but that really doesn’t matter because the best control option is the DualShock 3 motion controls. By gently rolling the DualShock 3 in any direction your flying person will reflect the controls with only a slight delay, one that lends itself nicely to some hairy moments and mad dashes to try and recover. 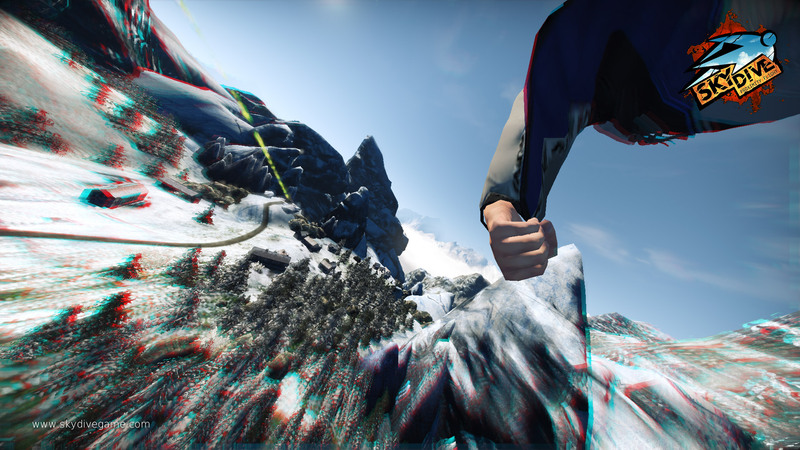 Tapping the triangle button while in-game switches the camera from third-person to one mounted on the left leg, to one on the right leg, and finally to the ultimate adrenaline-pumping first-person camera. Third-person is the easiest overall and the others are there for the thrill of it. At no point while playing this game in first-person view did I not feel like I was Superman. I mean, this is the only way to fly. Narrowly avoiding collision after collision with jagged rocks and treetops is exhilarating. Mastering the controls just requires playing the Challenges mode part way through. I started off with the Routes challenges which entailed flying through a certain number of light rings. This is followed by Tricks challenges that will teach the art of barrel rolls and front or back flips. 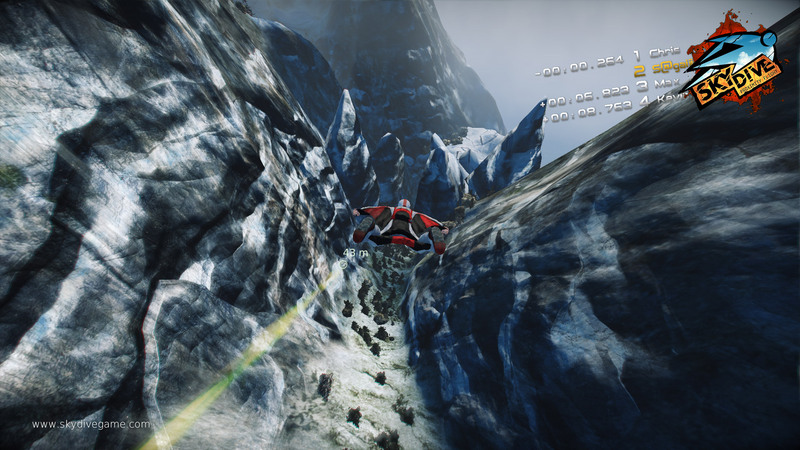 Once I realized that performing tricks while grazing the terrain was how to quickly build the adrenaline meter to perform a death defying boost, I was sold. It didn’t take long in Challenges mode for me to crave a bit more than a solo interaction, and so I jumped into the four player AI controlled Adrenaline Race mode. It’s just too bad there are only four races to tackle. But there is an online layer to Adrenaline Race not to be ignored. Pressing the square button on any of the four races will bring up the current fastest time online leaderboard. I enjoyed taking first place on all of these leaderboards against other media types I’m sure, but I imagine these top times will quickly be trump by our skillful readers. Ultimately, the goal in Skydive: Proximity Flight is to earn three stars on every challenge, race and freestyle event. Tricking while proximity flying was paramount to my success. Doing so will unlock additional challenges and characters. Did I mention there is a flying squirrel, Dracula and ghostly character? Plus a couple real world daredevils make an appearance as playable characters. Switching characters is seamless. 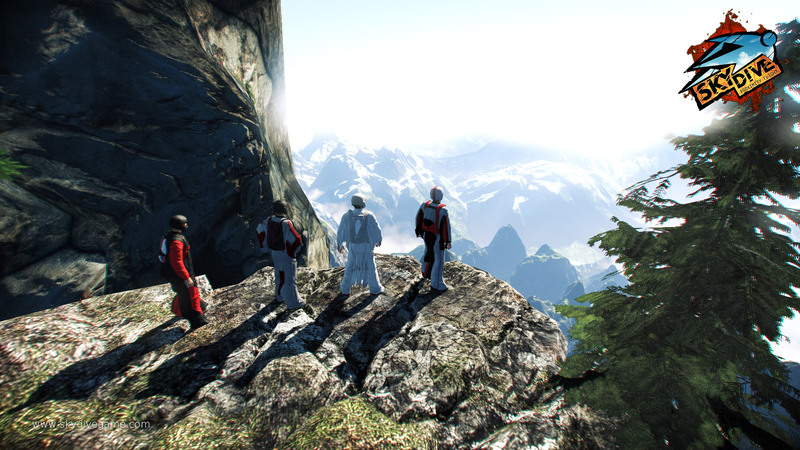 Just before leaping from the cliff or platform, a tap of the square button will bring up the character select screen offering 14 characters to choose from, each with their own weight, speed and maneuverability stats. In Freestyle mode, I noticed that most of the levels actually have eight different starting points with the eighth one being leap from a hot air balloon. Every starting point is from a different place in the level and this is where I really understood how massive these levels really are. In the races, the four levels just seem to go on and on, and they also seemed to have been designed specifically for races because it kept going down and down rather than feeling flat. Choosing the right line has also had an impact on how far I’m able to fly. Like a flowered onion, Freestyle mode also has another layer to it by allowing the creation of custom challenges. In seconds, I created my first challenge with 15 rings to fly through and several other additional completion requirements. I could’ve made it insanely challenging by adding up to three additional completion criteria requiring things like trick points or total points to successfully complete my custom challenge. Once my challenge was saved, my friends can access it from within Friends Challenges. I can always go back and play my own challenges from within My Challenges. So far, I’ve only created two challenges, but I’m able to save up to 12 challenges, each adhering to the 3-star rule. I was surprised to discover I didn’t have to complete my own challenge before submitting or saving. It’s far too easy to create a challenge that is cruel and unusual punishment for friends. Calibrating the Move controllers required pointing each at the camera to assign a color and pressing a button while in the T-pose — like you may have seen motion capture actors do before acting out a scene in a Naughty Dog or Quantic Dreams game. With a push of the Move button, or what I like to call the “A” button, Dracula jumped. I’m now holding my arms out trying to figure this out because there was no on screen demonstration for how to flying with my arms. Fortunately, it was intuitive requiring only that I raise my arms to have my character rise and slow down, or lower my arms to enter into a dive. Tricking was a different story. I had to hold the Move button while seesawing my arms to perform a barrel roll, or raise and lower to perform a frontflip and backflip respectively. Tricking was…tricky using the Move controllers, but overall just as accurate as using the motion controls of the DualShock 3. If you’re wondering how well the game works with the left stick controls, just stick – to the motion controls. 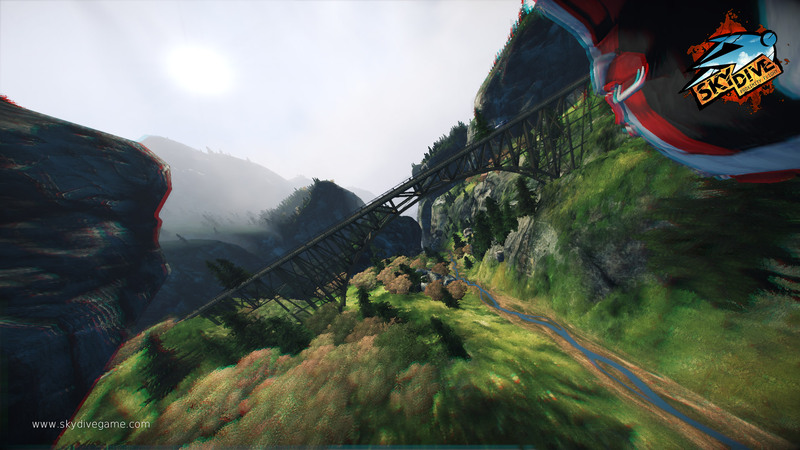 My time with Skydive: Proximity Flight, while pressed with a sense of urgency for the sake of this review, was indeed shorter than I would have liked. Having said that, there is no flight sim game in my current library or gaming history that has given me such satisfaction. The title is rather misleading as this is not a skydiving game. Instead, the focus should have been solely on the proximity flying. If you have a penchant for extreme sports or near fatal collisions with the side of the Grand Canyon, I implore you to give Skydive: Proximity Flight your full attention. Did I mention it has 51 trophies including a platinum?! !